NEW ORLEANS, LA -- The roommate of a man arrested in a Louisiana state trooper's death was found dead Monday, and the suspect in the trooper's slaying is also suspected in this case, a sheriff said. The man was found dead Monday in a home he shared with Kevin Daigle, 54, in Moss Bluff, Calcasieu Parish Tony Mancuso said Monday at a news conference. He said a deputy went by the home Monday morning after authorities were notified that the roommate had not arrived at work. The deputy found the roommate dead amid signs of a struggle. The roommate's name was not immediately released. "We are just now processing the scene," he said. "We really don't have a lot of answers." Senior Trooper Steven Vincent, 43, died Monday, a day after an apparently stranded motorist shot him in the head and then stood over him to tell him he was going to die soon, state police said. Authorities plan to charge Daigle with first-degree murder in the trooper's slaying. Vincent had been trying to help a man whose pickup truck was stuck sideways in a ditch, Col. Mike Edmonson said. "Tragically these things happen far too often around the country. Our thoughts and prayers continue to be with Steven and his family," said Edmonson during a news conference Monday. "I watched the tape yesterday. It was frightening to watch," Edmonson said, referring to the dashboard video. Officials have not released the video, but Edmonson said it showed that Vincent did everything right. Edmonson also introduced the good Samaritan who he said wrestled the sawed-off shotgun away from the man accused of shooting the trooper. "This is a hero," Edmonson said of Robert LeDoux of Iowa, Louisiana, a town of about 3,100 where one of Vincent's brothers is police chief. LeDoux was the first of four people who stopped to help. Another driver who'd passed the shooting scene told LeDoux that a trooper had been shot, so LeDoux sped there, jumped out, and grabbed Kevin Daigle and "moved him off our trooper," Edmonson said. LeDoux then used Vincent's radio to let police know an officer was down and ask for help. LeDoux did not speak at the news conference. Edmonson shook hands with him and then hugged him. Edmonson said Daigle, 54, of Lake Charles, was under arrest at a hospital. 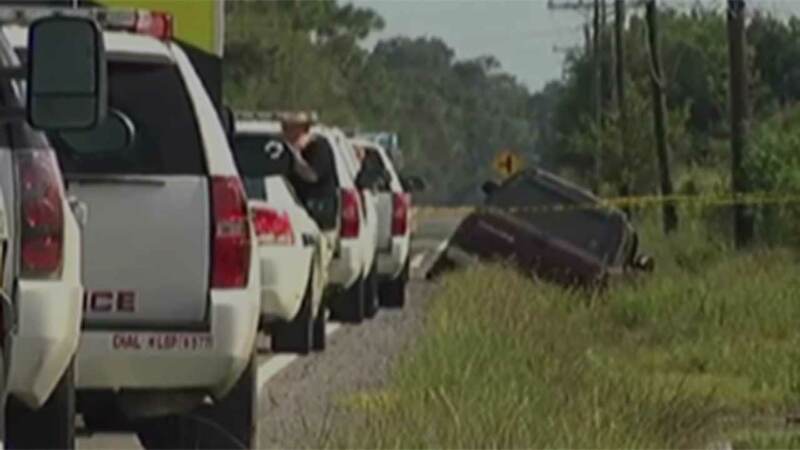 Police video showed Vincent, a 13-year state police veteran in southwest Louisiana and member of a law enforcement family, very professionally trying to talk a man out of the vehicle stuck sideways in a ditch, Edmonson said Sunday. He said the truck door opened and Daigle came out with the shotgun. "That's not meant to scare people or warn people. That's meant to harm people, to kill someone," Edmonson said. He said the tape shows the shotgun blast. "I saw my trooper go backwards and back toward his unit, where he was going to try to get some help out there," Edmonson said. After the shooting, he said, Daigle wandered into the road and over to Vincent, asking if he was alive. "You could hear him breathing, telling him, 'You're lucky. You're lucky - you're going to die soon.' That's the words that came out of his mouth," Edmonson said. Edmonson said Daigle had "numerous DWIs" and other arrests that he wouldn't discuss because he didn't know whether they resulted in convictions. Sgt. James Anderson, southwest Louisiana spokesman for state police, said Daigle was hospitalized for some scrapes and other injuries he sustained while the other motorists subdued him. Daigle is white and so was Vincent, he said. Edmonson said Vincent leaves behind a wife, Katherine, and a 9-year-old son, Ethan. Edmonson said Sunday that, in addition to the police chief brother, another brother is a state trooper. Anderson described Vincent as an optimistic, positive person with a sharp mind and a love for the New Orleans Saints football team. He was a marathon runner who just the night before had told his wife that he was going out to run a marathon - just for fun - and came back hours later, Edmonson said Monday. "Nobody wore this badge more proudly than Steven Vincent," the state police chief said.